I am so happy that you could come out to the country today and enjoy some of this wonderful weather that we are having. Don't you just love the change of seasons when we begin to stock our pantry with foods for fall with all the cozy flavors. We have our tables set up near the outdoor kitchen today, the coffee pot is on the burner, just help yourself and enjoy your stay. I can't wait to see what you have brought to the party today so lets get to it. Thank You so much for coming today, your visits are always very important to me. Thanks for hosting, Miz Helen. And thanks for the sweet comments you left me this week. Hope you have a wonderful week! Miz Helen, I have shared Chocolate Chip Mini Muffins. Thank you for hosting! I shared my recipe for Tomato Soup and an article about Sugar, Cancer and the Low Carb Diet. Thank you for the party, Miz Helen. You know I had to share the Muy Bueno mushroom salsa! I also linked up a PB, banana, and chocolate smoothie. Hope you have a beautiful weekend. Thanks for the Party! Have a super week! It was such fun to be with you and Pat at our special lunch. Thank you for hosting and have a happy week. I'm loving the change of seasons and preparing some more fall type foods! It's starting to cool off here a bit. Have a great week! Thanks for hosting, have a great rest of the week! It's been awhile since I posted a recipe to your party but I wanted to join in on the fun this week. Look forward to browsing what everyone post, always looking for new recipes to try. Thanks for hosting! Hi Miz Helen! Thank you so much for hosting this great party! Thanks for hosting - I look forward to your party each week! Today I shared: Butter - Make Your Own! Thank you so much for hosting Miz Helen and choosing my Skinny Crock Pot Taco Stew to fill your plate last week!!! I am DELIGHTED!!! :) Today I linked up Cinnamon Roll Cookies - I'm ready for FALL! I hope you have a wonderful rest of your week! Hi Miz Helen, thank you so much for hosting! I love visiting and seeing all the delicious links, my mouth is watering! Thanks for hosting Miz Helen. I've linked a Spicy Basil Chicken that can be on the table in less than 30 minutes. Good morning Miz Helen. Looks like you have another fabulous party going on here!I linked up my homemade Macaroni and Cheese recipe :) Have a wonderful day. I love that you have an outdoor kitchen. Your house sounds so conducive to good eating and good conversation. Have a lovely weekend. Thanks for hosting! This week I'm sharing a recipe for Roasted Garlic & Sweet Potato Soup. It's a delicious, hearty and nourishing soup that is perfect for this time of year. It's gluten free and the chicken broth can be replaced with vegetable broth to make it suitable for vegans. Enjoy!! Have a great week!! Thank you for hosting. I added your button to my link party list on my blog. Hope you enjoy the Slow Cooker BBQ Chicken and Cheesy Pumpkin Grits, they're a favorite around our house. Thank you for hosting Miz Helen! 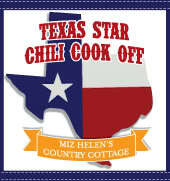 I am looking forward to the Chili Cook-Off and all the great recipes! Thanks for hosting Miz Helen! Have a great day!! Hi Miz Helen, I love how you filled your plate this week...thanks for hosting another wonderful Full Plate Thursday event! Hi Miz Helen, It's so good to enjoy some change of season! Today I've brought some Tomato Salad with an Oil-Free Vinaigrette. It's not oil-free for a diet reason but simply because I like this on fresh, vine-ripe tomatoes. Have a wonderful week! I'm sharing some Healthy Camping Meals and a video on Irresistible 5 Ingredient Coconut Panna Cotta (DF). Thank you so much for hosting, Miz Helen! This week I have shared an Autumn Rice Pilaf. Hi Miz Helen! Thank you for featuring my Black Bean Salad, I'm honoured! This week I'm sharing my recipe for gluten free Cherry Chocolate Cookies. Hope you have a lovely week! Thank you for hosting this linky! I'm sharing a recipe for Basil & Pine Nut Ice Cream with Blackberry Swirl. It's unique, delicious, and healthy, believe it or not! Oh yeah I filled my plate with several of the features and "pin"ed them to my pinterest so I could try them all...thank you for hosting this awesome party every week where we can have an adventure with the foods. I've brought a plate ginger bars to share! Thank you for hosting, have a lovely weekend! Thanks for hosting a great party. Have a wonderful weekend! I brought some shaved Brussels Sprouts. A little late to the party but everything looks delicious :) Have a great weekend! Thank you for hosting yet once again.